Lincoln : University of Nebraska Press ; Jerusalem : Yad Vashem, c2005. xvi, 447 p. ; 24 cm. "We were both small nations whose existence could never be taken for granted," Vaclav Havel said of the Czechs and the Jews of Israel in 1990, and indeed, the complex and intimate link between the fortunes of these two peoples is unique in European history. This book, by one of the world's leading authorities on the history of Czech and Slovak Jewry during the Nazi period, is the first to thoroughly document this singular relationship and to trace its impact, both practical and profound, on the fate of the Jews of Bohemia and Moravia during the Holocaust. Livia Rothkirchen provides a detailed and comprehensive history of how Nazi rule in the Czech lands was shaped as much by local culture and circumstances as by military policy. The extraordinary nature of the Czech Jews' experience emerges clearly in chapters on the role of the Jewish minority in Czech life; the crises of the Munich agreement and the German occupation, the reaction of the local population to the persecution of the Jews, the policies of the London-based government in exile, the question of Jewish resistance, and the special case of the Terezin (Theresienstadt) ghetto. The Jews of Bohemia and Moravia is based on a wealth of primary documents, many uncovered only after the 1989 November Revolution. With an epilogue on the post-1945 period, this richly woven historical narrative supplies information essential to an understanding of the history of the Jews in Europe. The Jews of Bohemia and Moravia : facing the Holocaust / Livia Rothkirchen. Jews of Bohemia & Moravia. The comprehensive history of the Holocaust. Prologue : Prague and Jerusalem : spiritual ties between Czechs and Jews -- The historical setting -- Years of challenge and growth : the Jewish minority in Czechoslovakia (1918-38) -- The aftermath of Munich : the crisis of the intellectuals -- Under German occupation (1939-45) -- The protectorate governments and the "Final Solution" -- The Czechoslovak government-in-exile in London : attitudes and reactions to the Jewish plight -- Jews in the Czech home resistance -- The "righteous" and the brave : compassion and solidarity with the persecuted -- Gateway to death : the unique character of Ghetto Terezin (Theresienstadt) -- The spiritual legacy of the Terezín inmates -- Epilogue : between 1945 and the Velvet Revolution of 1989. 100 ME:PersonalName 1 $a Personal name Rothkirchen, Livia. $c Statement of responsibility Livia Rothkirchen. 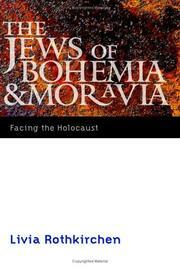 246 VaryingTitle 18 $a Title proper/short title Jews of Bohemia & Moravia. 440 Series Title 4 $a Title The comprehensive history of the Holocaust. 504 BibliogrphyNote $a Bibliography, etc. note Includes bibliographical references (p. -420) and index. 505 ContentsNote 0 $a Formatted contents note Prologue : Prague and Jerusalem : spiritual ties between Czechs and Jews -- The historical setting -- Years of challenge and growth : the Jewish minority in Czechoslovakia (1918-38) -- The aftermath of Munich : the crisis of the intellectuals -- Under German occupation (1939-45) -- The protectorate governments and the "Final Solution" -- The Czechoslovak government-in-exile in London : attitudes and reactions to the Jewish plight -- Jews in the Czech home resistance -- The "righteous" and the brave : compassion and solidarity with the persecuted -- Gateway to death : the unique character of Ghetto Terezin (Theresienstadt) -- The spiritual legacy of the Terezín inmates -- Epilogue : between 1945 and the Velvet Revolution of 1989.